by Dr Cristina Adriana Bejan Ion Ratiu Post-Doctoral Fellow in Romanian Studies, Georgetown University Hosted by Dr Mike Phillips OBE, British novelist, historian and curator Followed by a Q&A session Monday 7 March 2011, 19.00-21.00, The Ratiu Foundation / Romanian Cultural Centre Manchester Square, 18 Fitzhardinge Street, London W1H 6EQ; Tel. 020 7486 0295, ext 108; e-mail: bookings@romanianculturalcentre.org.uk; Entry is free but booking is essential. The interwar period in Romania is easily romanticized as a �Golden Era� but there were in fact genuine cultural triumphs that deserve to be celebrated not just in Romania , but as remarkable contributions to European thought and civilisation in the 20th Century. The foremost example is The Criterion Association, arguably the pinnacle of interwar Romanian Modernity, an intellectual and cultural society that featured the greatest minds of Romania�s �Young� Generation of 1927 (Emil Cioran, Petru Comarnescu, Mircea Eliade, Eugene Ionesco, and Mihail Sebastian, among others). Criterion successfully organized a number of provocative and progressive events: lectures, performances and art exhibitions, as well as a corresponding publication. Eliade considered Criterion to be an existentialist philosophical movement in its own right: the predecessor to Paris � Left Bank. The way that Criterion functioned illustrated the liberal ethos of the time: it operated according to democratic vote by its members. Criterion dissolved abruptly in 1935 due to the ascension of extremist politics within and outside the intellectual circle, King Carol II�s fear of the organization, and a tragic public scandal. This lecture focuses on the activity of Criterion from 1932 to 1935. 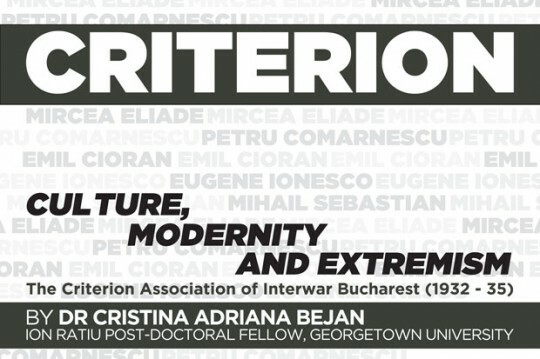 Cristina Adriana Bejan recently completed her DPhil (PhD) at the University of Oxford with a dissertation entitled �The Criterion Association: Friendship, Culture and Fascism in Interwar Bucharest� under the joint-supervision of Regius Professor Robert Evans and Professor Dennis Deletant. She completed her Masters in Modern History and started her doctorate at Oxford as a Rhodes Scholar, and research as a Fulbright Scholar at the University of Bucharest . She was the Yetta and Jacob Gelman Fellow at the Center for Advanced Holocaust Studies at the United States Holocaust Memorial Museum in 2009. Cristina is also a theatre artist, director and playwright. She is currently directing Lucian Blaga�s �Zalmoxis�, opening on 29 April 2011 at Georgetown University �s Devine Studio Theatre. Dr Mike Phillips OBE is a novelist, historian and curator, a member of the Heritage Lottery Fund�s Expert Panel, and consultant to various cultural organisations across Europe. Culture Power is a programme initiated by the Ratiu Foundation, consisting of a number of presentations and constructive dialogue with an invited audience. Organised by The Ratiu Foundation / Romanian Cultural Centre in London. With the support of ProFusion International Creative Consultancy.